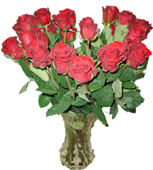 Beautiful red roses will brighten your day.Five roses - small; seven roses - medium; dozen roses - large arrangement! A romantic bouquet in natural organza wrapping. 7 pink roses, 3 pistachio chrysanthemum, 4 yellow alstromerias, greenery. 5 lilies, 3 roses with greenery and ribbon. 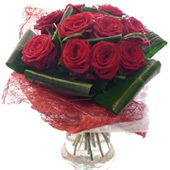 3 red roses, 3 chrysanthemum, 2 ghypsophillas, greenery. 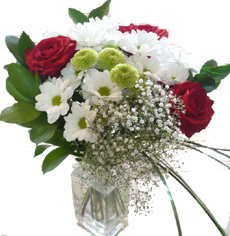 A nice and contrast flowers mix for festive occasions. Bright yellow gerberas with red roses, yellow and whire chrysanthemum in the nice natural wrapping with greenery. 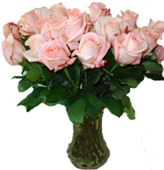 Fresh pink flowers show your tenderness and sympathy! Five roses - small; seven roses - medium; A dozen roses large arrangement!